Defender of Law and Tradition. Contents of the Minḥat Ḳenaot. (Graetz and others have, incorrectly, En Duran): Leader of the opposition to the rationalism of the Maimonists in the Montpellier controversy of 1303-1306; born at Lunel—hence his name, Yarḥi (from Yeraḥ = Moon = Lune). He was a descendant of Meshullam ben Jacob of Lunel, one of whose five sons was Joseph, the grandfather of Abba Mari, who, like his son Moses, the father of Abba Mari, was highly respected for both his rabbinical learning and his general erudition. Abba Mari moved to Montpellier, where, to his chagrin, he found the study of rabbinical lore greatly neglected by the young, who devoted all of their time and zeal to science and philosophy. The rationalistic method pursued by the new school of Maimonists (including Levi ben Abraham ben Ḥayyim of Villefranche, near the town of Perpignan, and Jacob Anatolio) especially provoked his indignation; for the sermons preached and the works published by them seemed to resolve the entire Scriptures into allegory and threatened to undermine the Jewish faith and the observance of the Law and tradition. He was not without some philosophical training. He mentions even with reverence the name of Maimonides, whose work he possessed and studied; but he was more inclined toward the mysticism of Naḥmanides. Above all, he was a thorough believer in revelation and in a divine providence, and was a sincere, law-observing follower of rabbinical Judaism. He would not allow Aristotle, "the searcher after God among the heathen," to be ranked with Moses. Abba Mari possessed considerable Talmudic knowledge and some poetical talent; but his zeal for the Law made him an agitator and a persecutor of all the advocates of liberal thought. 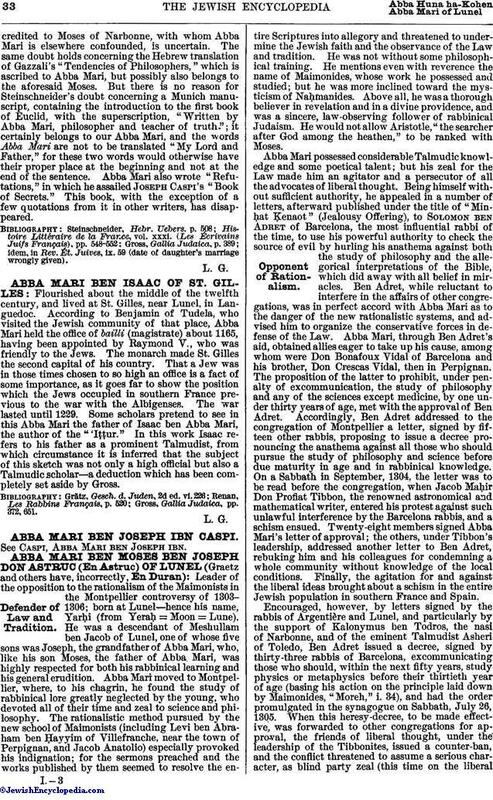 Being himself without sufficient authority, he appealed in a number of letters, afterward published under the title of "Minḥat Ḳenaot" (Jealousy Offering), to Solomon ben Adret of Barcelona, the most influential rabbi of the time, to use his powerful authority to check the source of evil by hurling his anathema against both the study of philosophy and the allegorical interpretations of the Bible, which did away with all belief in miracles. Ben Adret, while reluctant to interfere in the affairs of other congregations, was in perfect accord with Abba Mari as to the danger of the new rationalistic systems, and advised him to organize the conservative forces in defense of the Law. Abba Mari, through Ben Adret's aid, obtained allies eager to take up his cause, among whom were Don Bonafoux Vidal of Barcelona and his brother, Don Crescas Vidal, then in Perpignan. The proposition of the latter to prohibit, under penalty of excommunication, the study of philosophy and any of the sciences except medicine, by one under thirty years of age, met with the approval of Ben Adret. Accordingly, Ben Adret addressed to the congregation of Montpellier a letter, signed by fifteen other rabbis, proposing to issue a decree pronouncing the anathema against all those who should pursue the study of philosophy and science before due maturity in age and in rabbinical knowledge. On a Sabbath in September, 1304, the letter was to be read before the congregation, when Jacob Maḥir Don Profiat Tibbon, the renowned astronomical and mathematical writer, entered his protest against such unlawful interference by the Barcelona rabbis, and a schism ensued. Twenty-eight members signed Abba Mari's letter of approval; the others, under Tibbon's leadership, addressed another letter to Ben Adret, rebuking him and his colleagues for condemning a whole community without knowledge of the local conditions. Finally, the agitation for and against the liberal ideas brought about a schism in the entire Jewish population in southern France and Spain. Encouraged, however, by letters signed by the rabbis of Argentière and Lunel, and particularly by the support of Kalonymus ben Todros, the nasi of Narbonne, and of the eminent Talmudist Asheri of Toledo, Ben Adret issued a decree, signed by thirty-three rabbis of Barcelona, excommunicating those who should, within the next fifty years, study physics or metaphysics before their thirtieth year of age (basing his action on the principle laid down by Maimonides, "Moreh," i. 34), and had the order promulgated in the synagogue on Sabbath, July 26, 1305. When this heresy-decree, to be made effective, was forwarded to other congregations for approval, the friends of liberal thought, under the leadership of the Tibbonites, issued a counter-ban, and the conflict threatened to assume a serious character, as blind party zeal (this time on the liberalside) did not shrink from asking the civil powers to intervene. But an unlooked-for calamity brought the warfare to an end. The expulsion of the Jews from France by Philip IV. ("the Fair"), in 1306, caused the Jews of Montpellier to take refuge, partly in Provence, partly in Perpignan and partly in Majorca. Consequently, Abba Mari removed first to Arles, and, within the same year, to Perpignan, where he finally settled and disappeared from public view. There he published his correspondence with Ben Adret and his colleagues. Abba Mari collected the correspondence and added to each letter a few explanatory notes. Of this collection, called "Minḥat Ḳenaot," there are several manuscript copies extant; namely, at Oxford (Neubauer, "Cat. Bodl. Hebr. MSS. ", Nos.2182 and 2221); Paris, Bibl. Nat. No. 976; Günzburg Libr., St. Petersburg; Parma; Ramsgate Montefiore College Library (formerly Halberstam, No. 192); and Turin. Some of these (Oxford, No. 2221, and Paris, Bibl. Nat.) are mere fragments. 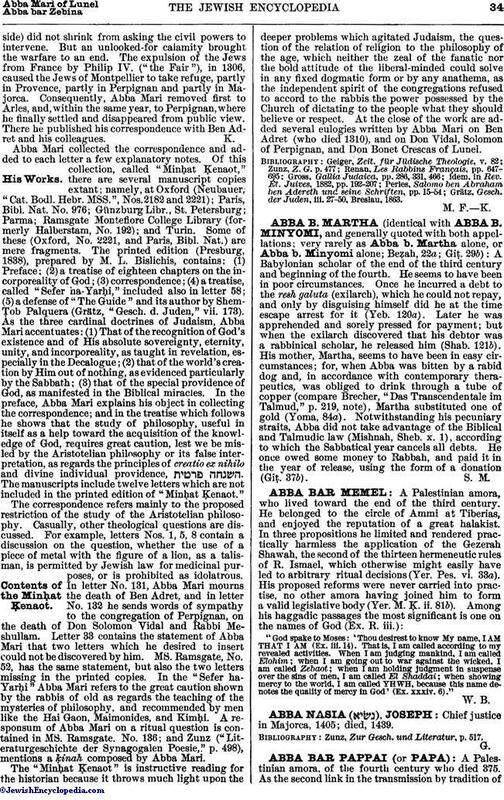 The printed edition (Presburg, 1838), prepared by M. L. Bislichis, contains: (1) Preface; (2) a treatise of eighteen chapters on the incorporeality of God; (3) correspondence; (4) a treatise, called "Sefer ha-Yarḥi," included also in letter 58; (5) a defense of "The Guide" and its author by Shem-Ṭob Palquera (Grätz, "Gesch. d. Juden," vii. 173). As the three cardinal doctrines of Judaism, Abba Mari accentuates: (1) That of the recognition of God's existence and of His absolute sovereignty, eternity, unity, and incorporeality, as taught in revelation, especially in the Decalogue; (2) that of the world's creation by Him out of nothing, as evidenced particularly by the Sabbath; (3) that of the special providence of God, as manifested in the Biblical miracles. In the preface, Abba Mari explains his object in collecting the correspondence; and in the treatise which follows he shows that the study of philosophy, useful in itself as a help toward the acquisition of the knowledge of God, requires great caution, lest we be misled by the Aristotelian philosophy or its false interpretation, as regards the principles of creatio ex nihilo and divine individual providence, . The manuscripts include twelve letters which are not included in the printed edition of "Minḥat Ḳenaot." The correspondence refers mainly to the proposed restriction of the study of the Aristotelian philosophy. Casually, other theological questions are discussed. For example, letters Nos. 1, 5, 8 contain a discussion on the question, whether the use of a piece of metal with the figure of a lion, as a talisman, is permitted by Jewish law for medicinal purposes, or is prohibited as idolatrous. In letter No. 131, Abba Mari mourns the death of Ben Adret, and in letter No. 132 he sends words of sympathy to the congregation of Perpignan, on the death of Don Solomon Vidal and Rabbi Meshullam. Letter 33 contains the statement of Abba Mari that two letters which he desired to insert could not be discovered by him. MS. Ramsgate, No. 52, has the same statement, but also the two letters missing in the printed copies. In the "Sefer ha-Yarḥi" Abba Mari refers to the great caution shown by the rabbis of old as regards the teaching of the mysteries of philosophy, and recommended by men like the Hai Gaon, Maimonides, and Kimḥi. A responsum of Abba Mari on a ritual question is contained in MS. Ramsgate, No. 136; and Zunz ("Literaturgeschichte der Synagogalen Poesie," p. 498), mentions a ḳinah composed by Abba Mari. The "Minḥat Ḳenaot" is instructive reading for the historian because it throws much light upon the deeper problems which agitated Judaism, the question of the relation of religion to the philosophy of the age, which neither the zeal of the fanatic nor the bold attitude of the liberal-minded could solve in any fixed dogmatic form or by any anathema, as the independent spirit of the congregations refused to accord to the rabbis the power possessed by the Church of dictating to the people what they should believe or respect. At the close of the work are added several eulogies written by Abba Mari on Ben Adret (who died 1310), and on Don Vidal, Solomon of Perpignan, and Don Bonet Crescas of Lunel. Grätz, Gesch. der Juden, iii. 27-50, Breslau, 1863.